Have you ever heard about amigurumi? Sounds like a japanese, isn't? Last Sunday, I went to Festival Rajutan Indonesia, at Museum of Bank Mandiri. They had some classes, including amigurumi, such as knitting, crocheting, yubiami (that was the first time I heard this word), and wire crocheting. Obviously, I wanted to attend all of the classes, but I had a limited money. So, I pick Amigurumi Class, because I still curious about it. I had attempted to make make one, but failed, or you can say it had been abandoned. Hahahahha. I made a little pink pig, the class was fun (6 women including me, but no teenager except myself), and the time was limited. It should be started on 9 am and ended on 12. But it started on 9.15, and ended on (I didn't know, I left the class because I felt my pig was considered finish) may be about 2 pm. We did exchanged facebook name (I was surprised because we only met once and possibly won't meet each other anymore), some one brought a digicam, and took a pic, and now published on facebook. I bought 2 acrylic yarns, and a Clover circular knitting needle. They had so much differences on the price for the same product on the different stands. When I got home, I looked for some free amigurumi pattern. 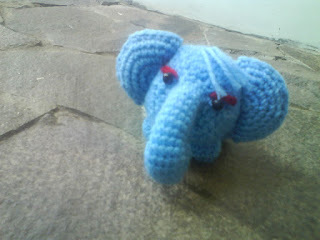 I have been told about lion brand , so I decided to make a Blue Elephant. You can find some easy cute amigurumi patterns here if you can't read the written pattern but very understand the illustrated pattern.